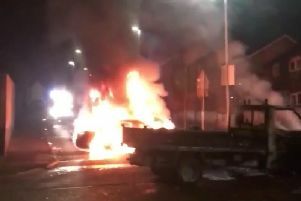 The PSNI believe a series of security alerts in Derry were designed to ‘frustrate’ the investigation into Saturday’s car bombing. Superintendent Gordon McCalmont said that despite a ‘challenging’ couple of days police had adequate resources to cope with the public safety operations and core policing duties. He said that as well as the security alerts, police received 200 calls and dealt with reports of domestic violence, burglaries and other crime and said the PSNI were ‘not found wanting’. At a press conference, the officer spoke of his ‘frustration and anger’ about the ‘level of harm, fear and disruption caused to this proud community’. Superintendent McCalmont used the press conference to issue and appeal for witnesses to any of the incidents. The officer confirmed that the main line of enquiry for their investigation is that the incidents were carried out by the New IRA, adding that they do not believe it is ‘Brexit related’. He said the support his officers received from the community has been ‘absolutely fantastic’. He said there were no ‘no go areas’ in the city and ‘Derry is open for business’.